This is a normal test, which the psychologist will conduct. The test includes exposing the students manually to 60 words, which are general in nature, with a suitable gap of 15 seconds to form the sentences. The test is designed to check the practical intelligence of the students. In this test, unlike TAT the stimulus is better defined than the picture, suitable written. If you recall, constructing of sentences is an old practice which we undergo in the primary level of schooling. The sentences framed should be comprehensive, complete using the word effectively. Students should include the word which has been shown by the assessor. In case of omission of the specific words, utilizing its meaning in constructing of sentence is advocated. Do not get involved in antonyms/ synonyms, which is not required in the testing. Construction of sentences does not have any binding implications, and the sentences therefore should be framed logically and meaningful in nature. Do not tie down yourself by certain conditions and grammar; otherwise you will not be able to complete the sentences. Day to day visuals and experiences can be incorporated, idioms, phrases can be logically used and sermons and suggestion should be limited. Using high sounding English can be avoided. Remember, do not create a complex profile rather help the assessor and practical intelligence, keeping mind, whatever you do in service Selection Board should be true and suiting your personality rather than copying high profile students and landing you in stress related situations. Now-a-days majority of students apply for Armed Forces while working in call centers and BPO’s, whose English profile is much better but expression is poor grammatically. Language is the instrument to access and convey conveniently and constructively. The words and sentences have been framed to help the students in applying their mind successfully. In the test a series of words are shown to the candidate in tie sequence. After seeing the word the candidate is required to write a sentence using that word directly or indirectly but conveying the sense of the original word. There are 60 words which are selected on the basis of each factor of OLQ contributing 15 words. The words are of two types: (1) + ve, (2) – ve. For example Love and Hate respectively. (1) He is a student of Govt. High School (Light Weight). (2) He is and intelligent, sincere, honest student (Heavy Weight). Therefore in this test a heavy weight, sentence is used not the light weight sentence is used. (2) Time: 15 sec/word (To see the word and write the sentence). When the word is changed on the board, the psychologist on duty announces the word “NEXT”. TPSN – she, a leader, an officer, an army officer, a manager, a scientist, a scholar, a proof, a doctor, an engineer, a captain, a citizen, a brave, etc. (showing leadership image). A TPSN can be qualified by a; prefix word of adjective like –good, efficient, intelligent, honest. Original word: noun, adjective, adverb, and verb. (1) She loves her friend as brothers and sisters. (2) An army officer loves his soldiers as his own brothers. (3) A scholar loves book t enhance his knowledge. (4) A scientist loves discoveries as his own creations. (5) A good captain loves his prayers to win the matches. (6) A leader loves his followers as his own supporters. (1) A good officer accepts his duties. (2) A brave accepts challenges of life boldly. (3) A good manager accepts useful suggestions from his colleagues. (4) A good student accepts learning from his teacher. (5) A scientist accepts new discoveries to benefit mankind. (7) A good engineer accepts new project to benefits society. (1) A good army officer rewards his soldiers for their bravery. (2) A captain rewards his team-mates. (3) A good manager rewards his workers for their excellent performance. (4) A principal rewards students for high academic achievement. (5) A good scientist rewards his fellow scientist for their new innovation. (1) An army officer sacrifices his life for the nation. (2) A good manager sacrifices his personal comforts for the well-being of the organization. (3) He sacrifices his personal interest to help others. (4) A scientist sacrifices his entire times for the new inventions. *Note: preferably select Role Play Method. Introduction on WAT in SSB / Rules & Techniques of WAT Formation. (SRT) in SSB interview. you will come to know the basic idea of SRT and how to answer different situations in Situation Reaction Test.I will be uploading 200+ SRT examples in my next post so please stay tuned. Situation Reaction Test (SRT) includes 60 live time situations enclosed in a booklet which are required to be answered in the sheet and space indicated. The booklet on situation Reaction test is exposed to students for thirty minutes, and the are asked to give complete and comprehensive answers. Practice session is conducted, and the rules and regulations are explained comprehensively by the psychologist. The instructions enclosed are self-explanatory, but the psychologist elucidates and explains the subject analysis completely. Live term situations are framed and the students are required to complete all the situations in the stipulated time, however, in case you fail to answer all the situations, ensure your answers are generally correct and complete. Reading and answering of situations should be automatic. Ensure, mind and body co-ordination is very essential to undertake the test. The stimulus is quite clear and comprehensive, unlike Thematic Appreciation Test and word Association Test. The students are subjected and exposed to situations in which they are required to read and commit themselves fully to the environment. In TAT, the story writing can be given any direction from one instance to another, and in WAT, the word can be used both in any form, whereas the situation reaction is required to be attempted and adhered responses. The situation should not be taken in isolation, but related to live time experiences and responses given with maturity and lot of mental application. Two sets of situations with answers and two sets without answers have been given for correct answers and individual practice. Ans. Raises money through the bank, performs the marriage, helps his parents and returns the loan through Equated Monthly Installments. Ans. Enquires welfare telephonically, assist by raising sufficient funds and send money through online transfer, request brothers, sisters and relatives to ensure that marriage ceremony is performed to the best of the ability. He will visit his sister on getting leave. Ans. Get In touch with the unit telephonically, in view of Bharat Bandh, leaves his house in sufficient time so that he is not late for duty. Ans. Immediately get up. Raise alarm, catch the intruder by hand, pull the chain apprehend the culprit and handing over the police. Ans. Gets down from the vehicle, runs the distance, clears the traffic jam, take alternative means of communication and attend the important meeting in time. Ans. Give medication to the driver suffering from high fever, take to wheels and drive the vehicle personally and conduct the patrolling. Ans. Take medication, lot of fluids, contribute his best to the team and maintains high moral sprits. Ans. Borrow from your friend, or use to jerseys underneath, make yourself comfortable and proceed for patrolling as per the laid down schedule. Ans. Intervene, try to find the reason of quarrel, settle the issue amicably and proceed to your destination. Ans. Motivate your colleagues, ensure they realize the essentials of digging trenches, and contribute effectively. Ans. Enjoy the rain, complete the entire task because rain is essential for development of plants and flowers. Ans. Learns the task through his friends develops interest, complete the task to the best of his ability irrespective o f the results. Ans. Ensure high standard of discipline, regular attendance by the students, respects the teachers and the colleagues, and help the staff in imparting best of education to the students in the college. I am putting more SRTs examples for your better practice, i have already putted the basic introduction & Tips for Situation Reaction Test to be followed in SSB, also you can practice 1-40 SRTs in my previous post-200+ SRTs examples with answers. Ans. Immediately rushes to the neighbours house, attract attention of the people, and bring fire under control and takes collective action to beat back the fire. Ans. Did not worry about the accident, does introspection gets scooter fructified and became careful in future. Ans. Try to find the north Direction, head towards the fire lane and get out of the jungle. Ans. Looks around and check all over again to trace the ticket, if not bring to the notice of the ticket collector and face the consequences. Q.45. To check the growth of population, what will he suggest? Ans. Make people aware about population control, importance of government policies and planning, small family norm and healthy living. Ans. Immediately goes to the rescue of his neighbour, carries out a detailed check and tried to rectify the fault, if the fault is major, lodge a report with authorities. Ans. Alerts the people, moves them out of bus, tries to extinguish the fire with the help of the passengers and locals, gets in touch with the police and the fire brigade, and bring fire under control. Ans. Does not loose his cool, alerts the neighbours give tough resistance, get in touch with police and rey to apprehend the miscreants. Ans. Gets into the water, raises alarm, rescues the boy, renders first aid medication and hospitalization and inform the parents and relatives. Ans. Immediately, run in the direction of the station, alerts the station master and helps to beat back the likely accident which would have resulted in casualties. Ans. Formed a group, gave a befitting fight to the dacoits, lodged an FIR, and helped the deceased family and ensured safety and security of the village. Ans. Immediately took the person to hospital ensure his meditation called his related and them moved to his work. Ans. Keep cool, take alternative train, face consequences, reach destination. Thereafter train, face consequences, reach destination. Thereafter does introspection to careful nest time in future. Ans. Checks the date, time, place, and venue, decide on the subject of discussion, participation by the teams of the various colleges and ensure success in the mission. Ans. Does introspection, makes a strict routine, play friendly matches, motivate the team members and ensure success in subsequent matches. Ans. Checks the direction of the north with the help of stars, magnetic compass, uses map direction finding and hits the nearest place identified to the venue. Ans. Convinces his father of his interest in joining the Armed Forces and satisfies his queries and ensures that he takes profession of his choice. Ans. Rationalizes the situation, speaks to his parents, convince them of his sister choice and marries her accordingly as per her wishes. Ans. Accepts the responsibility, works out the details, hunts the required talent, give extensive practice to the participants and ensure success. 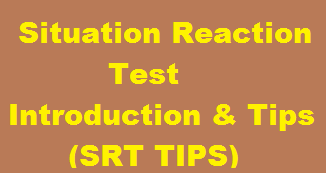 Aspirants i have uploaded the introduction of Situation Reaction Test and few examples of SRT in my previous post. If you are reading this first time then please go threw my previous post of Tips and Introduction of Situation Reaction Test in SSB. Here i am uploading 40 SRT for practice & more SRT Practice sets will be uploaded in my next post. Ans. Tries to give resistance, if not, telephonically gets in touch with police helpline, gives the general direction of the three persons and tries to help the police in nabbing the culprits. Ans. Raise and alarm, use his weapon in self-defence, over power the terrorist, catch and nab him and hand him over the authorities. Ans. Immediately gets in touch with the unit, takes the train, reaches his regimental headquarters and performs his best in the war. Ans. investigates the matter, if the excuse of the jawan is fabricated, takes disciplinary action against the person. Ans. Learns more about the task from his sunordinates, complete the assigned task to the best of his ability. Ans. Tries to check his location with the help of the locals/direction finding through stars/prismatic compass and tries to re-locate his direction and join the group. Ans. Reviews his point more judicially and gives more convincing answers to his boss to satisfy him. Ans. Believes in zero error syndrome, sustained effort and success in any field of work. Ans. Develop professional competence honesty loyalty integrity and sustained effort. Ans. Completes the assigned as given by the commanding officer and tries to convey his point of view politely if considered. Ans. Try to alert the people, carry out a surprise check of the people and lodge an FIR with the police boarding down the train. Ans. Take of part time job during day, continue his evening classes, give financial support to his parents and work towards his professional competence simultaneously. Ans. Notes down the telephone no. Informs the police telephonically, arranges first aid medication and hospitalization of the deceased person and inform their relatives and friends. Ans. Learns to know the correct art of mountain expedition through sustained practical guidance and climbing operations and ensure success in the subsequent mountain expedition. Ans. Tries to develop interest in the job, take the job more seriously and enjoy the work. Ans. Helps his friend to the best of his ability by giving financial and moral support and see that his friend recover from the loss. Ans. Gives his point of view with more logic and depth and convinces the group during the discussion. Ans. Motivates the staff by giving essentials of hard work, builds the staff both morally and socially and ensure that the staff working and efficiently. Ans. Tries to know more of the task through the colleagues and his subordinates, completes assigned task to the best of his knowledge and competence. Ans. Dies not get discouraged, make a detailed plan all over again and succeed in the mission. Ans. Raises an alarm, informs police and seeks help through helpline, gives stiff resistance to the dacoits till such time the police arrives and apprehends the culprits. Ans. Accepts the responsibility, makes a detailed programme of the variety entertainment show, carries out extensive rehearsals and ensures that the variety show I performed to the best. Ans. Raises an alarm, lights marshals, makes drum beats, fire in the air to frighten the animal till such time they succeed in the mission. Ans. Alerts the unit, gives optimum support to the Deputy Commissioner of Police and discharges his duty as per the laid down customs and traditions of the army. Ans. Goes more about details, makes extensive efforts, does lot of reading and takes the right step to succeed in the mission. Ans. Questioned the person of liming the house through the rope, if satisfied proceeds to the office if not take the required action to dissuade the person from making unaccepanle attempt of approaching the house through the rope. Ans. Accepted the responsibility. Conducted the group well and everybody enjoyed the tour in his command.